Why not take the morning of the work and chores and come along the St Budock Church Coﬀee Morning and Spring Fair in the very relaxing surroundings of the Penmorvah Manor Hotel. There is plenty of car parking space. This event is our annual social where all the community are invited for coﬀee and a chat. Entry is only £2.50, which includes coﬀee, so that everyone can feel included. Come along and enter a daﬀodil competition and maybe you will win a pack of daﬀodils bulbs to plant in your garden. Ron and his son Adrian have their daﬀodil nursery overlooking Maenporth Beach. They exhibit at the Cornwall Spring Flower Show at Boconnoc and the Falmouth Spring Flower Show at the Princess Pavilion. They have won many awards at shows all over the country and a prestigious Gold Medal Award from the Royal Horticultural Society. 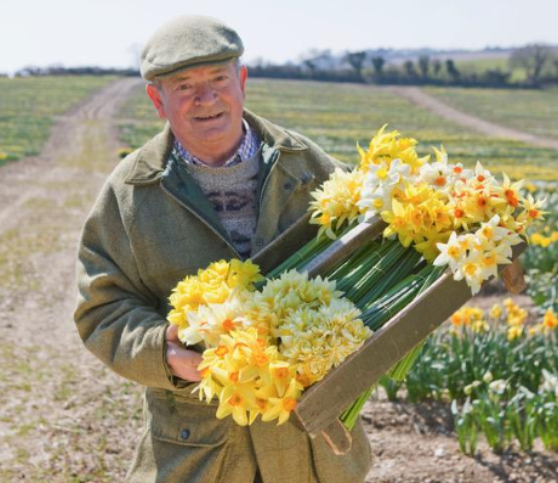 Ron is an expert in breeding daﬀodils and has created many very popular varieties. Ron and Maureen have supported Budock Church at the Coﬀee Morning for many years and many of you will have purchased a few bunches of his beautiful ﬂowers from the plant stall. If you need any further information please feel free to get in touch with Lorna Crewes on 01326 250307 or email me at rosemerrynfarm@gmail.com.